In Spring 1917, the Yankees took the then 20-year-old Ferguson to camp in Macon, Georgia where manager Bill Donovan was impressed by Ferguson’s “smoke” but thought him “too frail” to pitch in the majors,6 a somewhat odd assessment given the youngster’s six-foot-one/180 pound frame. Ferguson was optioned to the Utica Utes of the Class B New York State League to begin the season and there compiled a 7-10 log. Recalled by the Yankees in August, Alex was immediately sold with option to the Bridgeport Americans of the Eastern League, a faster-paced Class B circuit. For Bridgeport, Ferguson went 6-4 in 10 late-season starts, to finish the 1917 campaign a cumulative 13-14. In December 1917, the Yankees sold Ferguson to Baltimore of the Class AA International League, but Alex never pitched for the Orioles. In April 1918, he was sold back to New York, which then optioned Ferguson to Bridgeport again. By mid-August, an eye-catching 16-3 record for the Americans had earned Alex a promotion to New York. On August 16, 1918, 21-year old Alex Ferguson made his major-league debut at the Polo Grounds, pitching middle innings relief for the Yankees in a 12-4 loss to the Cleveland Indians. Alex was shaky, allowing two hits and two walks but got five outs without being scored upon. Close to three years would elapse before he saw action in another major-league game. Almost immediately after his initial Yankees appearance, military duty called. Alex was inducted into the US Army Ambulance Corps and spent the next the next six months at Camp Meade in Maryland. He mustered out in time to attend spring training with the Yankees, but did not make the club. For the 1919 season, Ferguson was a member of the Toledo Mud Hens of the Class AA American Association, going 12-16, with a 3.35 ERA in 212 innings pitched for the seventh-place (59-91) club. Although he remained Yankees’ property, Alex did not make the club in 1920 either. But a standout 21-13 record for the International League Jersey City Skeeters presaged Alex Ferguson’s return to the majors. Now 24 years old, Ferguson was among the young hurlers whom Yankees manager Miller Huggins slated for relief duty with the club during the 1921 season. “He’s a screwball pitcher,” Huggins informed sportswriters inquiring about Ferguson. “But he hasn’t developed a curve. Give him a curve and he’ll be a world beater,” said the Mighty Mite.7 But with or without a curveball, Alex did not impress. Used sparingly, he went 3-1 in 17 appearances, but posted a high 5.91 ERA while surrendering 64 hits and 27 walks in a mere 56 1/3 innings pitched. And he only fanned nine batters. Ferguson was on the Yankees’ 1921 World Series roster but saw no action in the postseason clash, lost to the Giants five games to three. On February 24, 1922, Ferguson was obtained on waivers by the Boston Red Sox, a once-proud franchise in precipitous decline. Inserted into the starting rotation of a last-place club, Alex posted 9-16 (1922) and 9-13 (1923) records that pretty much corresponded with the winning percentages logged by the Sox for those seasons. In 1924, Boston inched up to seventh place in AL standings, with Alex posting career-best totals in innings pitched (237 2/3), wins (14), and strikeouts (78). But his 17 losses tied teammate Howard Ehmke for the most in the AL, and his walks (108) far exceeded his strikeouts. The following season would find Alex Ferguson at the quicksilver pinnacle of his MLB career. The 1925 campaign began poorly, with Alex pitching ineffectively (0-2, with a 10.91 ERA in five appearances) for the Bosox. On May 5, 1925, Boston dealt Ferguson and veteran outfielder Bobby Veach to the Yankees in exchange for pitcher Ray Francis and $9,000. Ferguson’s second tour of duty in New York was brief and ineffectual, a 4-2 record disguising a 7.79 ERA in 54 innings pitched. On August 17, the Ferguson contract was purchased by the AL pennant-defending Washington Senators, anxious to acquire a spot starter/utility pitcher to spell an overworked and ageing staff. Once in a Senators uniform, Alex surpassed even the rosiest of club expectations. Down the pennant stretch, he went 5-1, while completing three of his six late-season starts. On September 24, a 6-2 Ferguson victory over Cleveland in the second game of a doubleheader gave Alex the honor of capturing the 1925 pennant clincher for Washington. For the World Series against the Pittsburgh Pirates, Senators manager Bucky Harris stayed with his hot pitching hand, bypassing regular season stalwarts Dutch Ruether (18-7) and Tom Zachary (12-15) to insert Ferguson into the Series rotation. Slotted behind future Hall of Famers Walter Johnson and Stan Coveleski, Alex did not disappoint, tossing seven strong innings to register a 4-3 victory over the Pirates’ Ray Kremer in Game Three. Three days later and with the Senators holding a three-games-to-two Series edge, Alex faced off against Kremer again. He turned in a near-repeat of his earlier Series start, but this time that was not good enough. Kremer pitched Pittsburgh to a 3-2 win, squaring the Series and setting the stage for a dramatic come-from-behind 9-7 Pirates victory in the Series finale. Alex had pitched creditably in defeat, posting a 1-1 record, with a 3.21 ERA in the 1925 Series. In 14 innings, he had allowed only 13 hits and struck out 11. 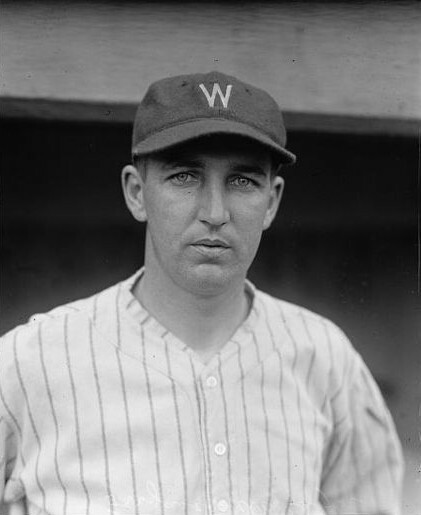 His late-season and World Series performance for the 1925 Washington Senators would be the highlight of Alex Ferguson’s major-league career. After this heady moment, Ferguson’s career took a sharp downward turn. As he later recalled, “I just couldn’t get anybody out” during the 1926 season.11 By late-June, the Ferguson record stood at 3-4, with a whopping 7.74 ERA, the product of 69 hits and 18 walks surrendered in only 47 2/3 innings of work. The Senators thereupon traded him to the Buffalo Bisons of the International League in exchange for outfield prospect Danny Taylor. Alex regained his stride in Buffalo, posting a 12-6 record in 20 appearances. Purchased by the Philadelphia Phillies, Alex spent the next three seasons in the National League, pitching for a woeful cellar-dweller in the band box Baker Bowl. His first NL start was a success, a complete game 3-2 victory over Brooklyn. But from there, things would go downhill. By year’s end, Alex’s losses doubled his wins. Yet the 8-16/4.84 ERA Ferguson marks for the 1927 season were actually a fractional improvement over the overall 51-103/5.36 ERA Phillies’ pitching norms. To his credit, Ferguson posted a career-high 16 complete games (in 31 starts) and his 73 strikeouts exceeded the 65 free passes that he gave out in 227 innings pitched that season. The 1928 season was much the same. Seeing reduced action, Alex went 5-10, with a 5.88 ERA for an even worse 43-109 National League tail-ender. Ferguson began the 1929 campaign in Philadelphia but was placed on waivers after a 1-2/12.08 start. Claimed by Brooklyn, his major-league career concluded with three ineffective appearances (0-1/seven runs surrendered in two innings pitched) for the Dodgers. In ten major-league seasons, Alex Ferguson posted a 61-85 (.418) record, with a 4.93 ERA in 257 games. In 1,241 2/3 innings pitched, he allowed 1,455 hits and gave up 482 walks, while striking out 397. A journeyman at best, Ferguson could nonetheless take pride in his contribution to the 1925 American League pennant won by the Washington Senators, and in his Game Three World Series victory for the club. Now 32 years old and plagued by a sore arm, Alex soldiered on in the minors after his release by Brooklyn. The results were mixed. A solid 14-7 season for Toledo in 1930 was followed by a dismal 3-13 campaign split between the Mud Hens and Buffalo the next year. From there, Ferguson descended to lower-tier competition. In 1933, a 13-10 season divided between Wilmington and Durham in the Class B Piedmont League brought the professional playing career of Alex Ferguson to an end. His playing days now behind him, Alex returned to Bloomfield where he opened a liquor store-tavern called Cliff & Alex’s. The low key atmosphere of the establishment met the approval of local sportswriter Sam Pierson who related that, “The business is successful because it is operated in the same quiet way that characterized Alex’s stay in the big leagues. There are no bagatelle machines about, no nickel phonographs, no encouragement of dancing, and no roughhouse.”12 A bachelor throughout his baseball career, Alex married German-born Katherine Marie Cosgrove (nee Stromp) in September 1936. The couple’s 39-year marriage would be childless, but Alex would serve as step-father to Katherine’s son Joseph. After closing his tavern in the late 1940s, Ferguson tended bar at various local watering holes for the next 15 years. Suffering from heart disease, Alex entered the VA Hospital in Sepulveda, California on April 23, 1976. He died there three days later, aged 79.16 Following funeral services, he was buried in Conejo Mountain Memorial Park in Camarillo. Survivors included his wife Katherine, step-son Joe Cosgrove, and Joe’s family. Blessed with only modest talent, Alex Ferguson was an honest, hard-working pitcher whose effort often outshined the results. But his pride in having been a major leaguer for ten seasons was justified, and his career was an honorable one. 1 Alex Ferguson questionnaire, submitted in 1960 and currently on file at the Giamatti Research Center, National Baseball Hall of Fame and Museum, Cooperstown, New York. 2 Sources for the biographical detail of this profile include the Alex Ferguson file at the Giamatti Research Center; US Census data, and certain of the newspaper articles cited below, particular the late-life Alex Ferguson interview published in the Oxnard (Calif.) Press-Courier, March 25, 1973, supplied to the writer by West Coast baseball expert Bob Hoie. Alex’s younger siblings were Martha (born 1899), Frank (1909), and Raymond (1916). Likely the issue of a mixed-religion marriage, the Ferguson children were baptized at Sacred Heart Church in nearby Bloomfield and raised Roman Catholic. 3 As per “Thumbing the Pages of Baseball History in Bloomfield,” a 1939 pamphlet containing the remembrances of The (Bloomfield) Independent Press sportswriter Samuel C. Pierson, 63. The writer is indebted to Reference Librarian Joan Dorfman of the Bloomfield Public Library for providing Ferguson-related excerpts of the Pierson pamphlet. It appears that Alex did not miscalculate his ineptitude as a hitter. During his ten-year career in the majors, Ferguson posted an anemic .106 batting average. 4 Oxnard Press-Courier, March 25, 1973. 5 An earlier version of this bio mistakenly attributed the 1916 minor league stats of pitcher J.B. Ferguson to Alex. Thanks to Cliff Blau for bringing the error to the writer's attention. 6 As per an unidentified circa 1921 Fred Lieb column in the Ferguson file at the Giamatti Center. 7 Ibid. In time, Ferguson developed a serviceable curve but is better remembered today for being one of the first major league pitchers to throw a forkball. 8 During at least one offseason, Ferguson toured the country with Ed Holly’s Big Leaguers, a exhibition basketball team that featured Ferguson, Holly, Val Picinich, Dolly Stark, Hank Thormahlen, and other NY-NJ area baseball figures, as per Pierson, 69. 9 As reported in the New York Times, November 6, 1925. 10 As memorialized in the Oxnard Press-Courier, March 25, 1973. 13 See Oxnard Press-Courier, March 25, 1973. 15 As noted in an undated circa April 1976 column in The Independent Press. Alex Ferguson was also posthumously inducted into the Athletic Hall of Fame of Bloomfield after its opening in 1982. 16 As per the Ferguson death certificate, on file at the Giamatti Research Center.